Special Holiday Offer Buy One Admission Ticket Get One FREE when you enter coupon code CFX2018 from November 23rd – December 16th 2018. 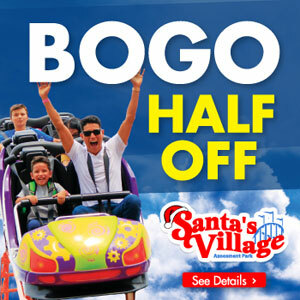 Click Here to purchase BOGO tickets. Santa’s Village Promises Something for Everyone! Now featuring and new to the lineup this year is the All New Super Cyclone Roller Coaster. See if you can ride the wickedly wild and turbulently twisted Super Cyclone! Now with 23 rides, attractions, animals, live entertainment, all your favorite fun foods, plus plenty of chances to win Big in Game Alley it’s the perfect time to plan your family or group visit. From Picnics to Parties, toddlers to tweens, and thrill seekers to party goers … Santa’s Village is the perfect place for a day of play!